Efforts to reach theMartian moon Phobos have long been outshined by missions to the red planetitself. Now, scientists in Russia, Canada and the U.S. are preparing their ownmissions to the largest moon of Mars. Mars actuallyhas two moons: Phobos and Deimos. They might more properly be calledsatellites, however, because they are extremely small, only a few kilometers indiameter.? In fact,some scientists think Phobos and Deimos could be asteroids that somehow endedup orbiting Mars instead of crashing into the planet, or they could beleftovers from the time of planetary formation. Another option is that themoons are fragments of Mars, blasted off the planet?s surface by a largeasteroid or comet impact. Whatevertheir origins, interms of space missions the moons have been overshadowed by the planet theyorbit. If a spacecraft is sent on a 6-month journey of many millions of miles,it seems anti-climatic to have it plop down on a tiny asteroid-like body whenMars itself is so close, beckoning with its many different regions to exploreand a complex history to unravel. Russian scientists, however, have been tryingto senda spacecraft to Phobos, the larger of the two Mars moons, for many years. Phobos 1and Phobos 2 were launched within 5 days of each other in July 1988. Phobos 1lost communications due to a software glitch that September, but Phobos 2 hadbetter luck and made it all the way to Mars orbit. Before the spacecraft couldsend its two probes to Phobos, however, the spacecraft?s signal was lost due toa computer malfunction. The RussianFederal Space Agency proposed sending a new mission to Phobos in 1999. CalledPhobos-Grunt (?grunt? being the Russian word for ?soil? ), this mission aims togather a sample of soil from the moon?s surface and send it back to Earth foranalysis. Although an unmanned sample return mission sounds complicated, theRussian space program has succeeded many times in conducting similar missionscloser to home. Between1959 and 1976, the USSR sent a fleet of robotic spacecraft to investigateEarth?s Moon.? Luna 16, Luna 20, and Luna 24 each dug up lunar soil and thensent a sample back to Earth via an ascent vehicle located on top of the lander.These lunar soil samples are now housed at the Vernadsky Institute ofGeochemistry and Analytical Chemistry in Moscow, Russia. Thedirector of the Institute, Erik Galimov, thinks samples from Phobos could helpanswer many mysteries about the Martian moon?s origin and composition. He saysthat we have been able to learn some details about Phobos by gazing at the moonwith telescopes, or by quick flybys of Mars orbiters such as ESA?s MarsExpress. These glimpses have shown that Phobos is made of dark material that doesnot reflect much light. This makes scientists suspect it has a chemicalcomposition similar to that of carbonaceouschondrite asteroids. But otheraspects of the moon can?t be learned simply by staring. For one thing, Galimovsays that remote instruments can?t tell us the absolute age of Phobos, while asample would allow us to measure that precisely. A sample also would allowscientists to measure the chemical isotopes, which could then be compared tothe isotopicsignatures of Martian meteorites that have landed on Earth to see howsimilar Phobos is to the planet it orbits. Similar studies were conducted onlunar samples, and they indicate that the Earth and our Moon formed from thesame kind of source material. A closerexamination of Phobos might reveal if it is one large hunk of rock, or agravitationally-bound rubble pile as many scientists now suspect. The questionof whether Phobos contains water ice, a potential resource for future Mars explorers,also could be answered. ?I think itwill be a very positive contribution, because we would have in our hand samplesfrom the Mars area,? says Galimov. Oneattraction Phobos holds over Mars is that it costs much less money to go there.Phobos has no atmosphere to contend with, and much lower gravity. Even so, thelatest estimated cost for the entire Phobos-Grunt mission is 2.4 billion rubles(about 72 million US dollars). Adding to the complications are the number ofinstruments that have been added the design plan over the years (the currentcount is 11 instruments ? most NASA spacecraft have 3 or 4 instrumentsonboard).? One of theplanned Phobos-Grunt experiments is the Living Interplanetary FlightExperiment, or LIFE, provided by the U.S.-based Planetary Society. Thisexperiment would carry various microorganisms, as well as a soil colony fromthe Arctic permafrost, to see how well they endure space travel. The experimentis controversial because of planetary protection issues ? scientists hope tofind evidence for life on Mars someday, and are careful to sterilize spacecraftso we don?t inadvertently carry life there. If Phobos-Grunt should accidentallycrash on Phobos or Mars, the life contained in the spacecraft probably wouldnot survive for long in the harsh environment, but most scientists don?t wantto risk contamination regardless. The launch ofPhobos-Grunt was scheduled to take place this October, but it now seems likely thelaunch date will be pushed back to 2011 at the earliest. Whenever the missiondoes launch, it will take 3 years for the lander to reach the small moon, touchdown on its surface, and then return its sample to Earth. 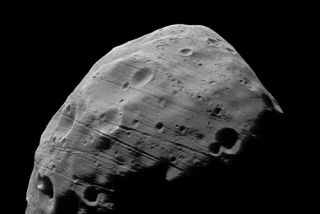 TheRussians are not the only ones who dream of Phobos. Another mission headed byOptech Inc. and the Mars Institute, and funded as a concept study by theCanadian Space Agency, is called PRIME, for "Phobos Reconnaissance and InternationalMars Exploration." The PRIME mission would be composed of an orbiter and lander,and each would carry 4 instruments designed to study various aspects ofPhobos's geology. Yet another mission concept, the Phobos-Deimos Sample ReturnMission (SRM), is being studied by NASA's Glenn Research Center. This missionwould rely on low-cost electric propulsion to land on Phobos and Deimos andbring back samples from the two moons. Thesemission studies are proceeding in part on the philosophy that Phobos could bekey to the future human exploration of Mars. Not only does the ease of landingand taking off from Phobos make it a good pit stop between Earth and Mars, butbecause Phobos is tidally-locked, always showing the same face to Mars, itcould be a stable location for a Mars communications relay or some sort ofmonitoring station. At present,neither PRIME nor the Phobos-Deimos SRM has a projected launch date. In the meantime,spacecraft currently orbiting Mars can study Phobos and Deimos whenever theyhappen to pass by. The MER rovers Spirit and Opportunity also have caughtglimpses of the moons, most notably when either Phobos or Deimos has passed infront of the sun. Neither moon is large enough or positioned so as to block outthe sun entirely like our Moon does during a solar eclipse, but perhaps theycast a brief shadow over the rovers as they flit by overhead.